It’s no secret that we love apples. We’ve made apple cider, apple pancakes, and even apple fries! Hell, I spent the past three weeks reviewing apple ciders. Simply put, apples are the best. Although we’ve dabbled in this combination before, it’s been at least a year since our last one. Of course I speak of an apple pizza. Pizza lab has featured sweet pies with fruit a number of times, so it’s only natural to return to one of our favorite fruits. Plus, it’s actually pretty Fall-themed too, so that makes this post quite timely. 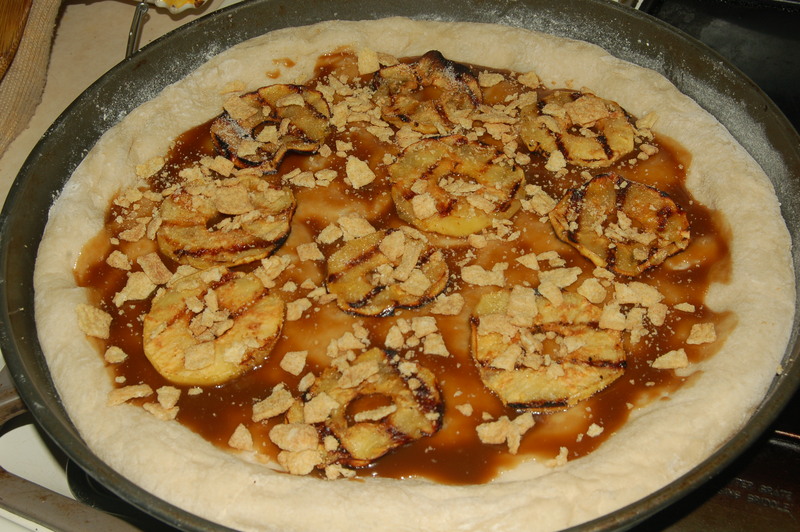 Today’s featured Pizza Lab is Grilled Caramel Apple Pizza. Believe it or not but this pizza’s original idea was conceived from eating roasted apples at the Long Island Garlic Festival. Yes, the one we presented our demo at in September. One stand was grilling whole apples on the barbecue, then selling the gooey, caramelized apples for all to eat. While eating these we pondered, what if you were to simply grill apple slices on a barbecue instead? Then we went on to ponder, what if you put those grilled apple slices onto a pizza? Afterall, we just recently had finished up our grilled pineapple pizza in Pizza Lab #22. All it took was some research on grilling apples at home and we were on our way. 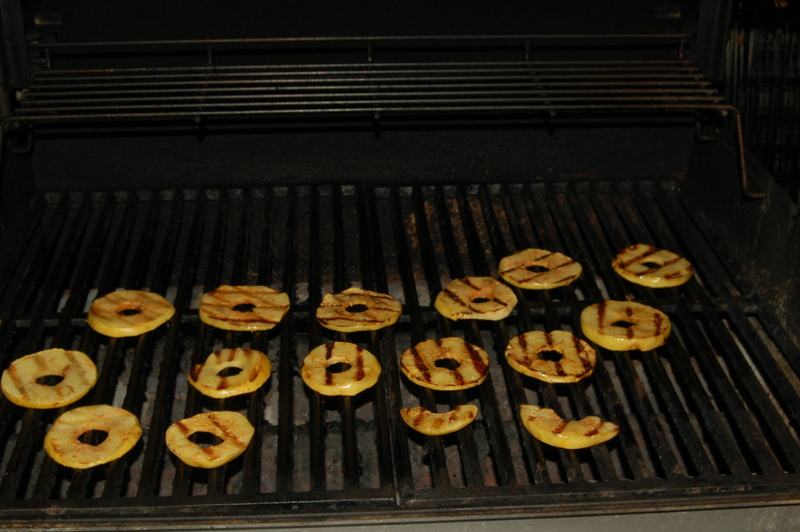 The apples were actually fairly easy to grill. Each apple had its core removed (since cores are gross and contain cyanide) and cut into rings.These rings were sliced pretty thin, almost chip-like, and then brushed with some butter. The slices were thrown onto the hot grill, sprinkled with cinnamon sugar, and cooked for about seven minutes. After this they were set aside, but the grill was left on since we’d need it later for the pizza. For a sauce, we decided to use a caramel sauce considering the amazing pairing that apples and caramel have. Caramel sauce is delicious, not to mention. It could pretty much go on any dessert and work well. 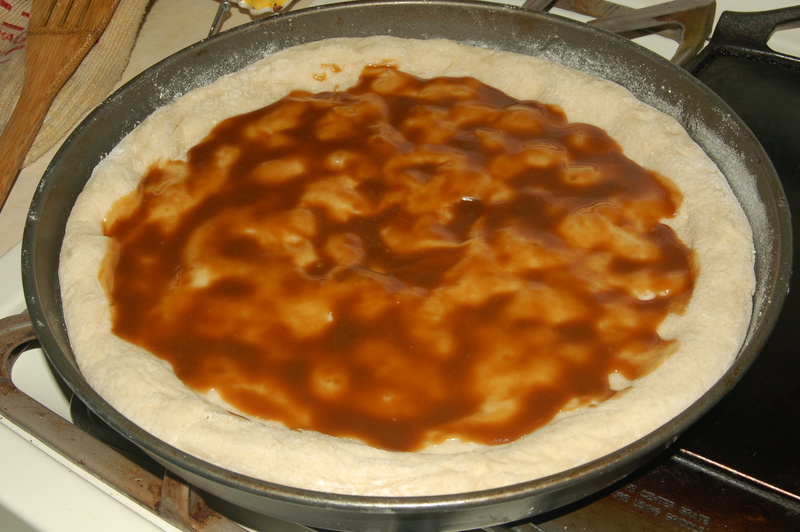 After making some up on the stove (though one could probably just use any old caramel sauce) it was spread onto the pizza in a generous layer. As with all of our grill pizzas, we parcooked the crust in the oven for a few minutes, just enough to get it solid. With the caramel down, we placed the apple slices on top, and as a fun garnish, we decided to pick out something crunchy that would complement the apples well. We threw around some ideas like nuts or pralines, however in the end we decided the best course of action was good old fashioned Cinnamon Toast Crunch. It’s crunchy and, come on, it’s got cinnamon swirls in each bite. The pizza got grilled until the crust was finished, and everything toasted together really well in the grill as usual. We were worried the apples might dry out or overcook, but they were still tender and yummy. Last but not least came a dairy topping. We almost went with mascarpone since it’s been our go-to dessert cheese in the past, however we decided we’d forego it once again in favor of whipped cream, due to the fact it’s a bit pricey and we end up throwing out some of it everytime we buy some. Overall, the pizza tasted really, really delicious. 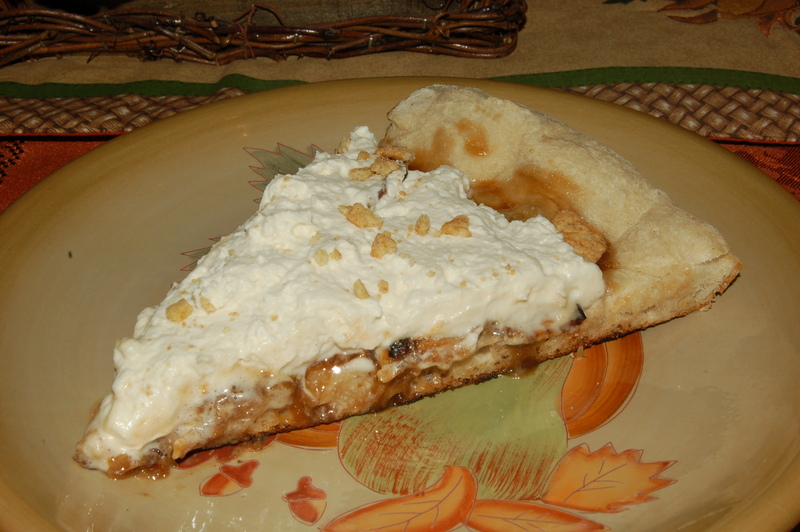 The caramel sauce and the apples combined are an absolute delight on their own, and in tandem with the pieces of Cinnamon Toast Crunch really made for a unique, tasty pizza. There was one caveat this time however, and it wasn’t even necessarily about the pizza being bad. Instead, we came to realize the whipped cream on top actually didn’t add a whole lot to the pizza. 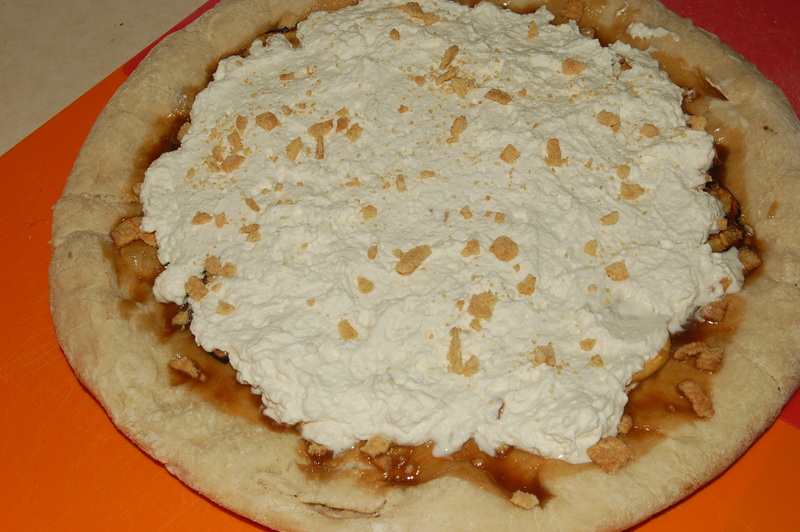 Its flavor was minimal up against the caramel and apple, and it covered up and hid what was actually a really attractive looking pizza from an aesthetic point of view. It wasn’t necessarily unpleasant, but the pizza probably would’ve been better without it. So if you’re looking to make your own, skip the whipped cream. Not to mention, whipped cream doesn’t keep well in the fridge, so after eating our week-old leftovers we both encountered some stomach maladies afterwards. Posted on November 6, 2014, in Pizza Lab and tagged apple, cinnamon, dessert, Fall, grilling, Pizza, yummy. Bookmark the permalink. 2 Comments.